Would you move abroad for a job? Moving to a new city for work is a pretty big deal. Moving to another country for a job is something else entirely. Yet a new survey found 64% of people worldwide say they would be game to cross borders for their careers. 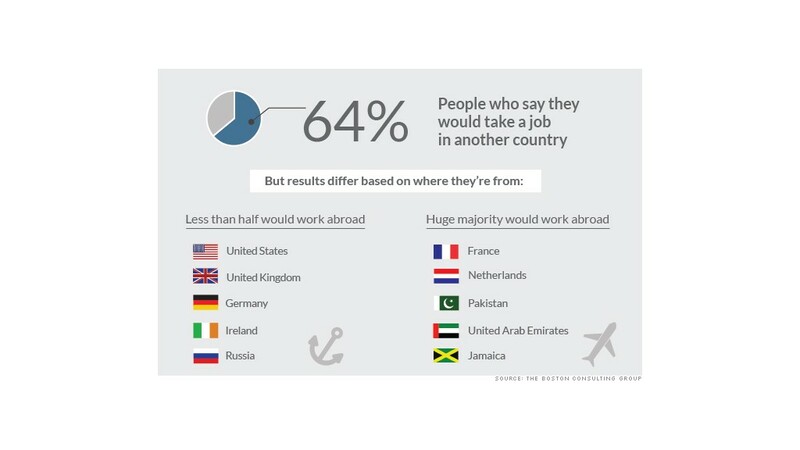 The Boston Consulting Group and The Network, an online recruiting firm, culled through more than 200,000 responses to their online survey, which sought to gauge who is willing to work abroad and why. Respondents from less developed economies - such as Pakistan, Jamaica, Honduras and Ghana - were much more willing to uproot themselves than workers in more stable economies. But France and the Netherlands broke that mold: More than 90% of the French and Dutch respondents said they'd be willing to go abroad. By contrast, less than half of the American, British and German respondents felt the same way. That's also true of the survey takers from Denmark, which is regularly found to be among the best for working parents and quality of life. Location, of course, makes a difference when choosing a new place to live. 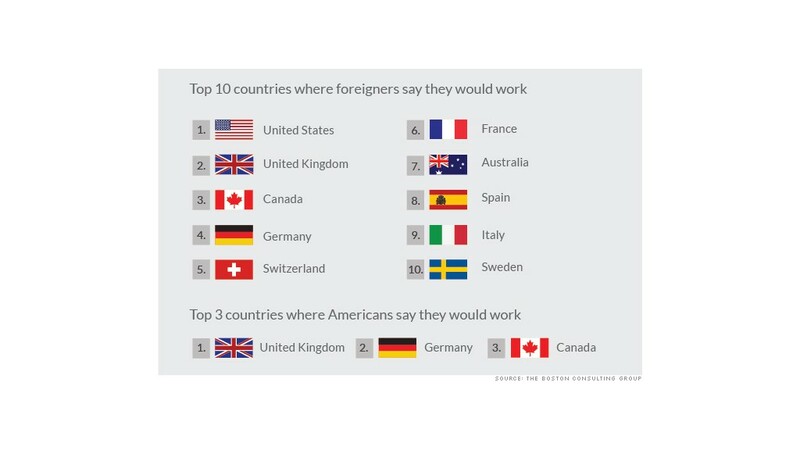 Among those who said they were willing to work abroad, non-U.S. citizens said they would most like to work in the United States, while Americans looking to ex-patriate said the United Kingdom would be their top destination. Survey takers also chose their favorite cities for jobs. Among all respondents, the top 10 cities were London, New York, Paris, Sydney, Madrid, Berlin, Barcelona, Toronto, Singapore and Rome. Even though the global workforce has become more mobile than ever, not every type of worker is eager to pack her bags. The BCG survey found that 70% of engineers, particularly those in information technology and telecommunications, were willing to go abroad. Far less willing were those who worked in the fields of health and social work, with only about half saying they'd take a job in another country.